DEMOLITION is now well underway at the former Greater Dandenong Council offices in Springvale. The council relocated to the new Dandenong Civic Centre in March last year and the old building was deemed unfit for other uses. 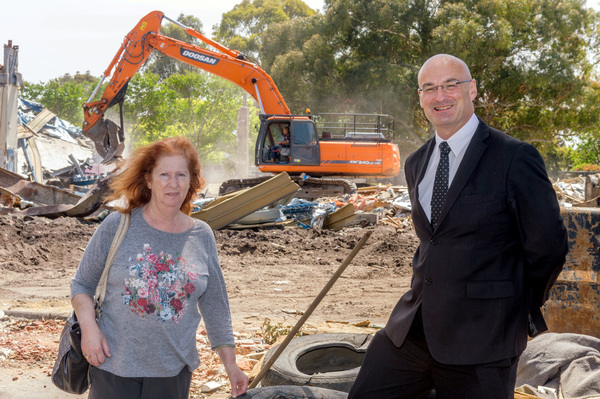 Demolition is to be completed by the end of the year and is the first stage of the Springvale Civic Space Masterplan, which will be rolled out over several years. Fencing around the demolition site has rendered 50 car parking spaces unavailable. The council said Springvale Library and Springvale Town Hall should not be impacted but the customer service centre, two meeting rooms and a playground might need to close for short periods. Temporary fencing will remain once the building is demolished while temporary new paths are created and grass is planted and allowed to grow. The council started community consultation regarding the precinct in 2011. The city hall and supper room is to be upgraded, a new library is to be built and a new Learning and Activity Hub would provide flexible community spaces. The chambers will be retained as community meeting rooms, the war memorial will feature in the new precinct design and there’ll be more open space. There’ll be no loss of car parking spaces, and the Springvale and District Historical Society will still have a home.